Nokia Lumia 800 update tripling battery life? 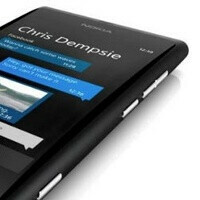 The Nokia Lumia 800 is the first Windows Phone by Nokia and while we agreed that it was a great first step for the Finns, the issue of its relatively short battery life hindered the experience. This gets fixed now with a big update with an equally big name - the 1600.2487.8107.12070 ROM. The update is said to triple the battery life on the Lumia 800 if you update from an old version. A bold claim that might be a bit overblown, but you should definitely notice an improvement in your phone’s one-charge longevity. Nokia makes it possible by better controlling screen brightness and lowering the discharge when idle - to around 70mA according to WPCentral, and to between 80mA and 90mA according to XDA Devs. The 12070 update has already arrived for the far eastern parts of the world like Singapore. It’s available via the Zune Desktop client. Additionally, the update improves the white balance of the 8-megapixel rear camera and brings better bass response for overall enhanced music quality. The battery life on my lumia is indeed very suspect so this might help it the odd time i use the phone!